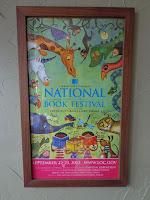 Last September 2012, we took our first real vacation as a family of six -- of course, it had to involve books. 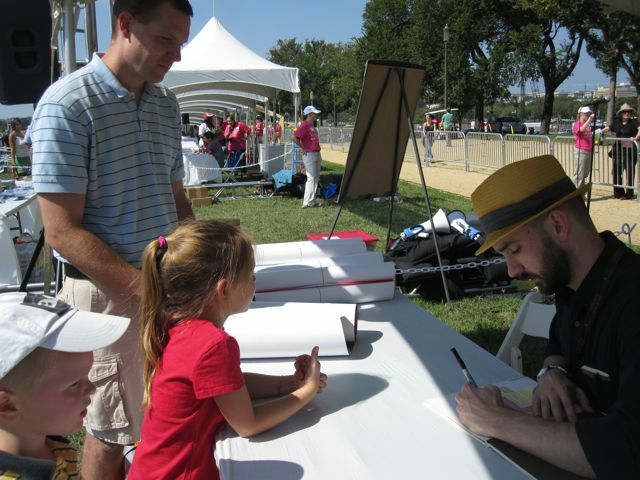 We rented a bigger van, enlisted the help of Grandma, and traveled from Ohio to Washington D.C. for the National Book Festival. We enjoyed seeing the sites, spending time with people who love reading, and listening to authors read their latest books. My daughter's favorite thing was getting autographs. 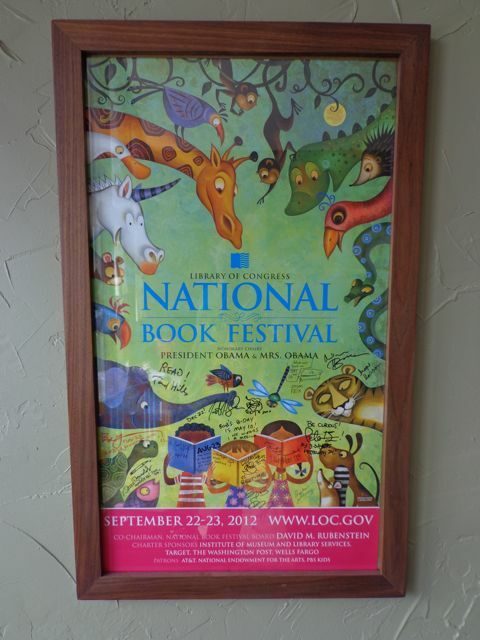 Upon returning home, we had a stack of books signed by many of our favorite authors, a cool poster with signatures and birthdays, and many unforgettable memories. One of my favorite childhood birthday memories was the time my mom baked me a round layer cake. It was yellow cake with chocolate frosting. But, the top layer of cake had a big crack down the middle of it, and so I called it an "Earthquake Cake." At first, I thought this cake was an 'imperfect' cake, but what I soon realized was that the big crack filled up with frosting...which made it even yummier...so that I ended up loving the earthquake cake. I loved it so much, that in subsequent years my mom began TRYING to mess up my birthday cakes, so they'd also have big cracks in them. When my mom would accidentally make me a perfect cake we'd intentionally add our own crack down the middle...and later fill it up with frosting. 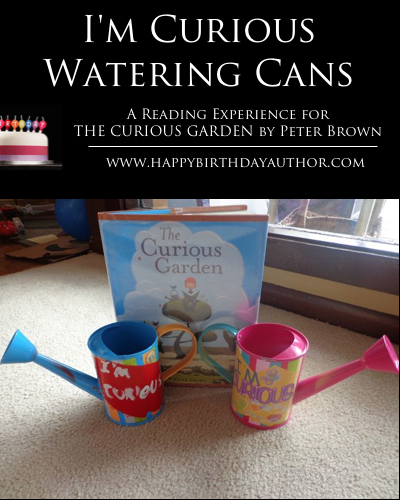 Peter Brown has published eight picture books including Creepy Carrots! by Aaron Reynolds which was just awarded a 2013 Caldecott Honor. Eleven years ago, Peter Brown moved to New York City to get serious about children's book publishing. "I was at a party and met a young children's book editor from Little Brown, named Alvina Ling. I showed her a book dummy I'd made called Flight of the Dodo, and after she helped me polish it up, Little Brown bought it!" (Seven Impossible Things). After that book came two about Chowder, a dog who is lovable even to people like me who would probably never have a dog as a pet. Peter Brown was asked in an interview with DesignMom, about when he first thought people started to take notice of his work. "The rest of the world first realized that I wasn't bad with words and pictures with my fourth picture book, The Curious Garden." 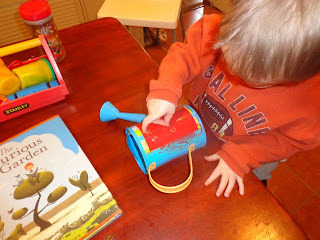 It was this book that also caught our attention this week and sparked an idea for a fun birthday celebration activity. The Curious Garden takes place in a grey, depressing, and lifeless city. Thankfully, Liam discovers a patch of wildflowers, cares for them, and encourages them to grow. Liam's efforts are contagious, others join in to help, and the garden spreads throughout the city. This helps the city emerge as a beautiful place for families to spend their days. "The Curious Garden was very much inspired by a place in New York City called the High Line. The High Line is an old abandoned, elevated railway that has become completely overgrown by wildflowers and plants and trees. I loved the idea that nature could spontaneously grow in unexpected places, like in the middle of a concrete jungle." (Peter Brown interview, Into the Wardrobe). Liam was not a very good gardener when he first discovered the curious garden. 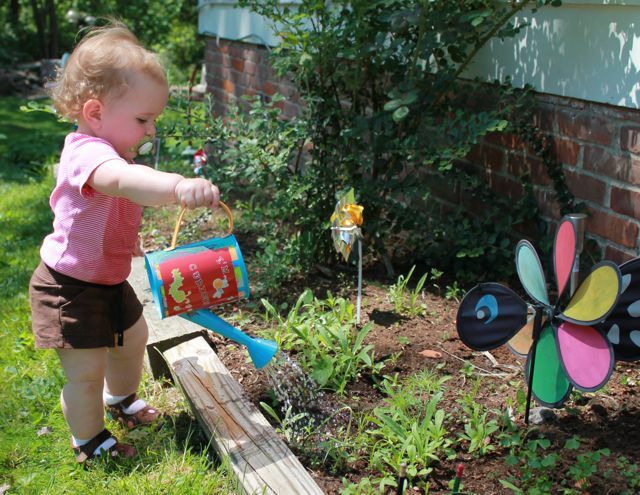 Initially, he watered wildflowers by dumping from a bucket. He successfully improvised by poking holes in the bucket for a more gentle watering. This worked for the first growing season, but then he got a little more serious about his gardening and upgraded to a real watering can. 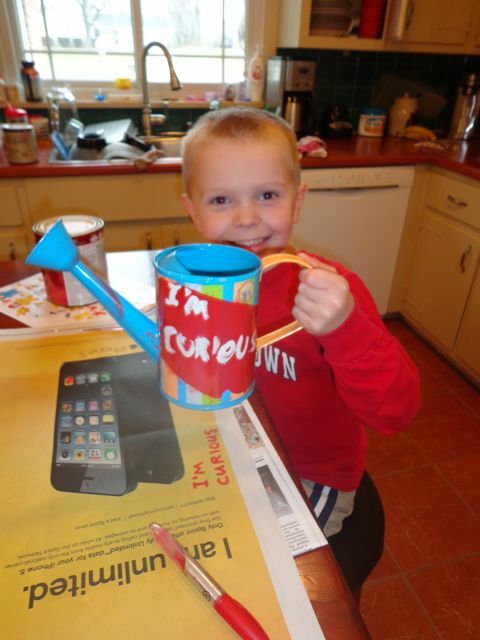 A curious gardener needs a hearty watering can. I was curious whether I could find watering cans in the middle of February. 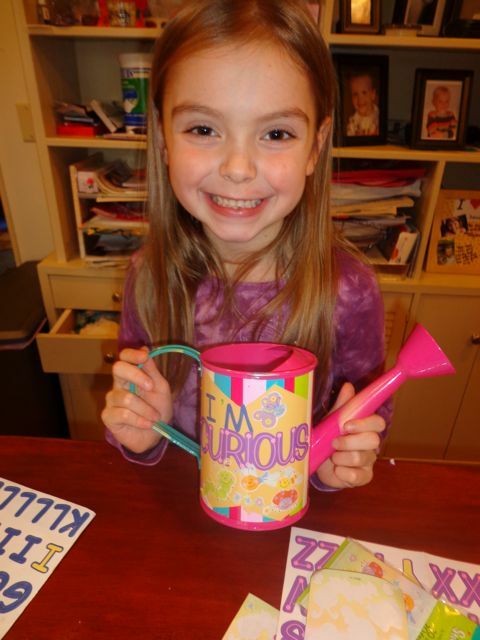 To my surprise, I was able to purchase 4 colorful kids-sized watering cans at Michael's craft supply store for about $6 each. I guess they want Spring to come as badly as I do. I would have liked to have solid color watering cans, but these were striped. So, we improvised much like Liam did with his bucket. We taped off an area and spray painted it a solid color. 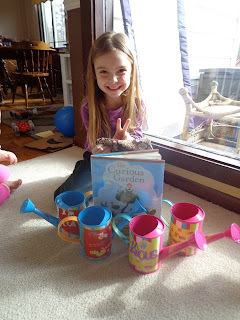 I told my children that there was only two rules to decorating our watering cans. On one side we would have the words, "I'm Curious" and on the other side would be their name. 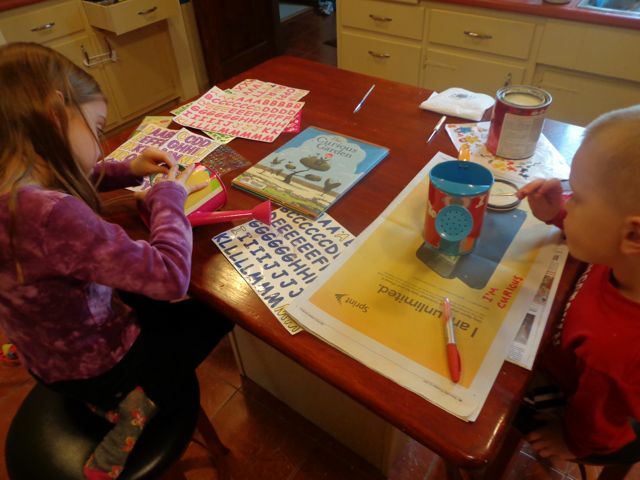 Lots of options were provided -- stickers, paint, markers. My son chose to paint. All four cans were coated with a clear sealant spray to allow us to use our watering cans this Spring and summer in our own Curious Garden. Bunny ears! My daughter was so pleased with her watering can that she decided that she will not be using it outside. She proudly displayed it in her bedroom. When I went back in the kitchen to clean up our mess I noticed that my daughter wrote this on the newspaper we had laid out on the kitchen counter. 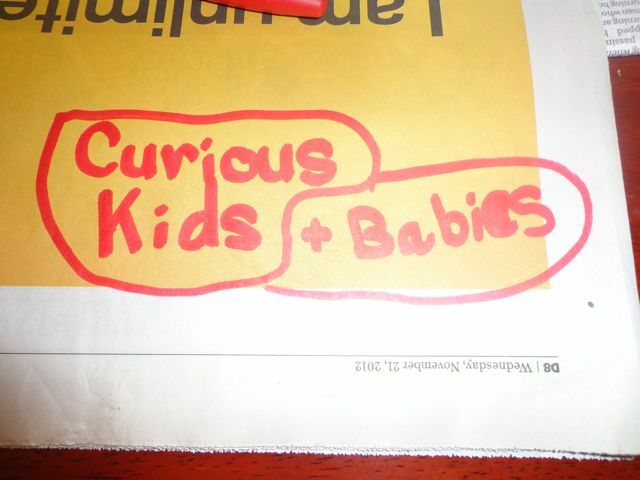 I am so happy to have curious kids! 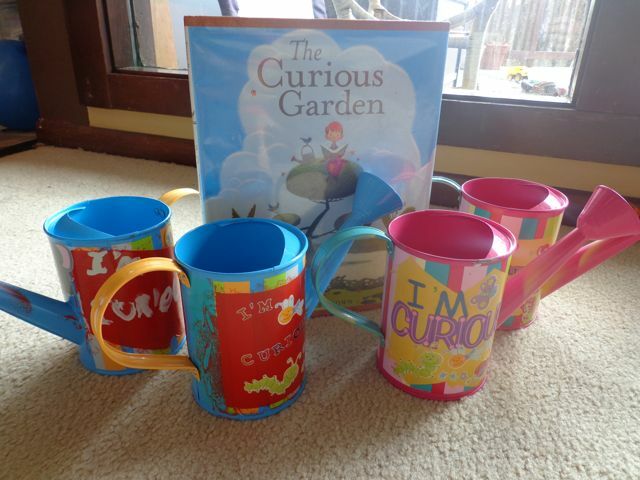 Update, May 2013: My youngest daughter is enjoying the I'm Curious Watering Cans. This year we planted wildflower seeds! We can't wait until they bloom! My youngest son and I were playing Star Wars this week in our family room. 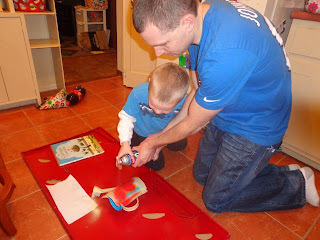 It was getting dark outside and we hadn't turned on any lights inside. He thought he heard something spooky down the hall and claimed it to be a monster. I asked him what it looked like and he said he didn't know. I then asked him if he could draw it and he said he could. I remembered reading earlier in the day that Peter Brown loved drawing when he was younger. He said in an interview with Into the Wardrobe, "I loved inventing characters. I would take a big sheet of paper and divide it up into six boxes. In each box I would draw a different monster, alien, or other bizarre creature. And below each creature I'd list their name, favorite food, hometown, personal motto, etc. I had a lot of fun imagining all the details of those characters and the worlds they lived in, and now I do the same thing for my career." 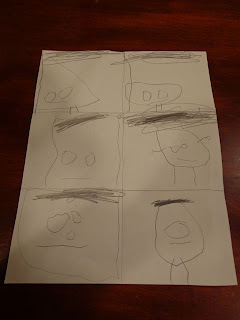 I folded the paper into 6 boxes and gave my youngest son a pencil. 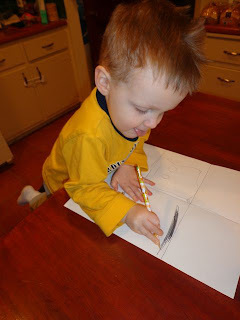 He just started drawing. 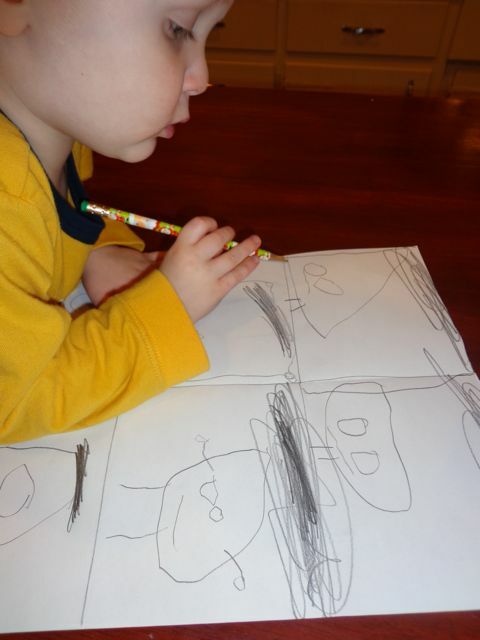 On this night he learned how to draw hair. I would like to introduce you to Chocolate Chip Monster, Hot Dog Monster, Pencil Monster, Tooth Monster, Pretzel Monster, and Hairy Monster. They live the exhaust vent in our kitchen. 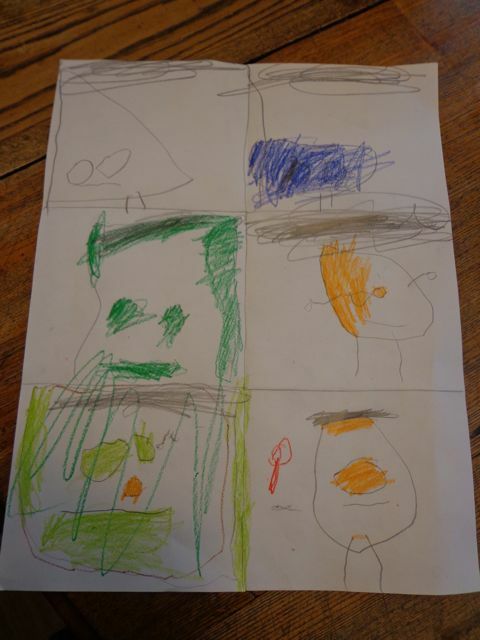 I left his drawing on the table and over the past few days he gradually added color too! Thank you Peter for sharing your childhood birthday memory with us. We hope you have a wonderful day filled with fun and frosting! Thank you for making books that inspire us to be curious and creative! 5. Text Interviews - Seven Impossible Things, Another from Seven Impossible Things, Scholastic, Dreams Can Be Reached Blog, Design Mom, Into the Wardrobe, Story Sleuths, Books Inc.
For my writer friends, I really liked this quote from Peter Brown in an interview with DesignMom, "I think my ideas for stories are unusual enough to be interesting, but familiar enough to be relatable."